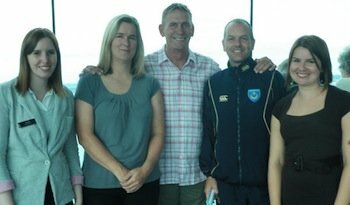 Portsmouth Football Club and the Spinnaker Tower have combined forces to promote Blue September in the city this month. The iconic landmark tower will be turning blue for three nights this month, lighting up the skyline for a good cause. Soaring 170 metres above Portsmouth Harbour and the Solenton the waterfront at Gunwharf Quays, the Spinnaker Tower is taller than the London Eye, Blackpool Tower and Big Ben. It offers amazing panoramic views of Portsmouth Harbour, the South coast and the Isle of Wight, with views stretching out for up to 23 miles. For Blue September, this national landmark is, like the campaign's other celebrity supporters, having its face painted blue - in this case with dazzling light rather than paint. You can see the spectacle on 12, 17 and 19 September. New Order fans will be delighted to hear that that means two Blue Mondays. Not sure about Blue Saturday - perhaps it should be the new Portmouth FC theme tune. Below, the team at the Pompey Sports & Education Foundation: Ellie Stokes, Clare Martin, ex Portsmouth goalkeeper Alan Knight MBE, Paul Allen and Jenny Nolan. Portsmouth FC back Blue September.